I know it has been almost a month but it has been a busy one.. with a little time here and there I was able to finish the base desk. I put the last coat of poly on it last night and was able to move it in to the office this afternoon and get that temporary desk moved out of the way. I will be taking it apart and recycling it into new furniture for DW new sewing room. The new desk fit in place great and I am now working on figuring out the next step which will more then likely be my hutch, then bookcases, then.. got a lot more furniture to build. I do like the way it turned out though. 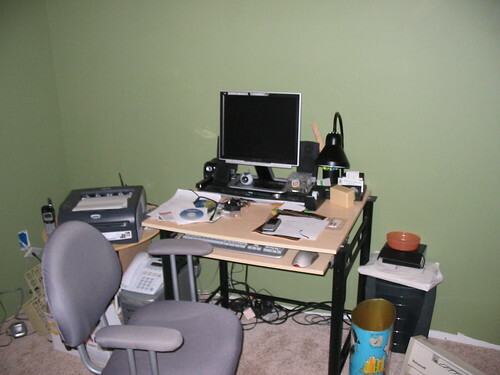 Looking at this pic I realize I need to go find those cable managers I have laying around here somewhere. 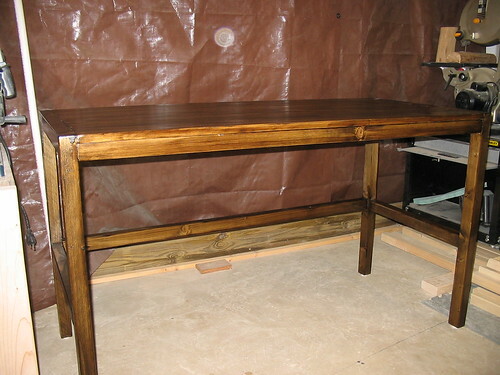 The desk is 48” x 24” amd made entirely of dimensional lumber bought at the two big box stores. I ripped the 2×4s in order to make it a little less chunky. All joints are Kreg. The finish is a is by General Finishes (available from Woodcraft) Antique Oak color.This was a recomenned stain from one of the guys at Woodcraft since it is waterbased but is almost gel like. I just used two coats of a semi-gloss minwax poly to finish the piece. Looking forward to the next pieces. Great desk, Chris! I really like the simple design. Glad you chose Pocket-Holes for your joinery. As for the cables… check out what a member of our Kreg Jig Owners’ Community did to solve that problem… he used a ‘hidden drawer’ where he stored his surge protector, extra hard drives, wires, etc. 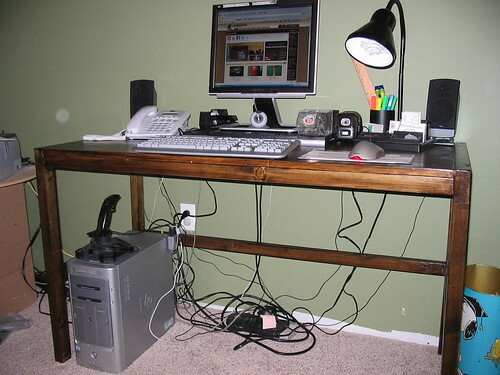 There’s only one wire (power cable) coming from the entire desk!